Bon Scrapatit Designs: HAPPY ST PADDY'S DAY Y'ALL!!! ARE YOU WEARIN' YOUR GREEN TODAY? NO PINCH ZONE AT MY HOUSE!!! HAPPY ST PADDY'S DAY Y'ALL!!! ARE YOU WEARIN' YOUR GREEN TODAY? NO PINCH ZONE AT MY HOUSE!!! Top of the evenin' to y'all and for those of ye who be Irish, I hope you've had a day of CELEBRATION and wearin' of the green! 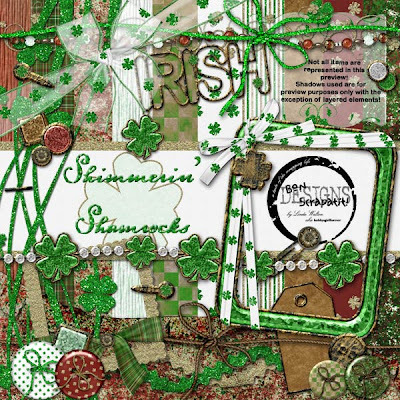 I've spent my past two days zipping, uploading, rezipping and reuploading files for my two NEW scrapkits, *Shimmerin' Shamrocks* and *Floral Frenzy*!!! WOO HOO! I've got kits for sale!!! LOL! Okay, I know! Well, shucks, I just can't help myself as it seems like it's been pert near FOREVER since I've had anything NEW to share! I will elaborate a bit more tomorrow or the day after as to my past week! I've not been here for the past two for a couple of different reasons and I shall cover those as well!!! But ... I am here NOW! How are y'all??? Anyone attend a special St. Paddy's Day celebration? I'd LOVE to hear about it. I cooked up a DOUBLE batch of corned beef and cabbage for the guys (they love it SO much they had me fix some on Saturday and it was GONE in a blink of the eyes!!!) and made the BIG mistake of indulging in some myself. I'm paying for it at the moment - this body just won't tolerate beef! Guess I TRULY have something to "beef" about now, don't I??? LOL! I MISS everyone and need to make my rounds!!! I have SO enjoyed ALL of your LOVELY comments and wish I could reply to each one personally and promptly, but it just has not been possible and I do appreciate your understanding. You are just the DEAREST of friends and I wish we could have a little "par-tay" going on right here on my blog!!! Tink (we really do have a lot in common, don't we? ), Sue, Elisa, Mandy, Liz, Monna, Osten and anyone else who's blogs I visit and haven't in a while - I shall be there to catch up with you this week!!! Thank you for keeping my spirits lifted while buried in paperwork, files, not feeling well, etc.! Y'all ROCK! I just wish to respond to some of the neato comments like the one from Vicki in Texas who has grandsons named Wyatt and Garret!!! Now is that not a kick or what? Robert's Wyatt was named after Wyatt Earp and the story with Garret is that Mom wanted to name him something similar and Dad did not like it, so Garret came to be!!! I LOVE the both as they are really VERY nice names! I also enjoyed reading about the dress you made LONG ago that matches the DAISY mini Patty and someone used the colors for their wedding along with daisies - TOO cool y'all!!! Any possibility of a layout with that dress Patty??? That would be AWESOME! 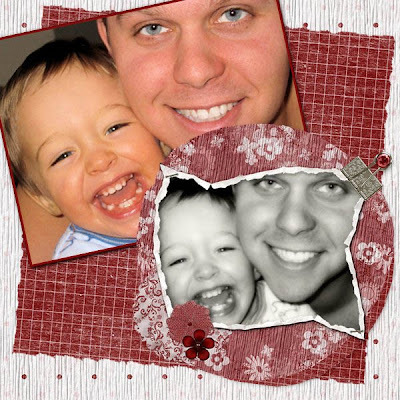 I had a REALLY nice treat in finding that Teresa from the site, JUST MOMMIES, had picked *Fresh As A Daisy* as a weekend challenge and posted her LOVELY layout of her DD, Megan on her blog. Thank you to both Teresa and Mandy for visiting. Mandy is Mandy Mystiques and her link is located on my sidebar. I shall be adding Teresa's site as well and will be suggesting to my DIL that she join as they cover A LOT of different topics that are JUST for Mommies and those wishing to be! AWESOME site y'all! Sandra, dearest Sandra ... thank you SO much for sharing about your mother and I am quite honored to be able to be a part of preserving her PRECIOUS memories for your family to relish for years to come. My thoughts and prayers are with you and yours during this time of healing that empty spot from your personal loss even though you know that she is now pain free. Aly dearest, you hit the nail right on the head darlin'. There is DEFINITELY a season for all things and for ALL things a purpose! Michelle, I got your e-mail and shall reply just as quickly as I am able. I do not like replying in haste so I wait until the timing is right and I can answer in my "right" mind! LOL! Thank you for your kind comments and encouragement! Tiffany, I SO appreciate all your LOVELY comments and suggestions. I will see what I can come up with for birthdays! I find that a bit of a challenge as there are SO many different themes and color schemes and my head goes into a whirlwind thinking about it!!! Perhaps a few ideas from y'all and something might CLICK, ya think? LOL! Cindy, we DEFINITELY need to catch up girl! Yes, and I need to get moving on some tutorials for y'all too! Nancy and Sharon - you are SO ever faithful and you keep me lifted! THANK YOU! THANK YOU to EACH and EVERY one of you. I am SO overwhelmed with the LOVE that FLOWS through SCRAPLAND. WOO HOO!!! "Digi-Sisters United"!!! I'm LOVIN' it!!! Okay, since I've taken the time to try to catch up with MANY of you, I shall leave the rest for tomorrow and the next day and I should have all of my new previews and links up for you tomorrow. 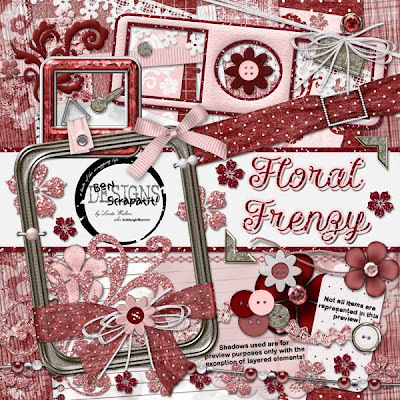 I shall post below only the MAIN PREVIEW from each kit as well as a layout from our DEAR, Bonnie Beechler using my *Floral Frenzy* scrapkit as well as a LOVELY freebie that she has SO generously bestowed upon us tonight! THANK YOU Ms. Bonnie!!! We LOVE you! Night all ... sleep well ... see you tomorrow! that BURST! I LOVE, LOVE, LOVE it - can't stop smilin'! WOW!!! HAVE I BEEN BUSY, OR WHAT??? 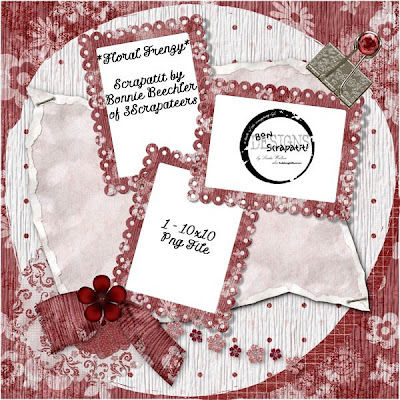 WOO HOO - IT'S FANTABULOUS FREEBIE FRIDAY!!! MORE CHARMING FREEBIES FOR Y'ALL!!! FOOLS RUSH IN!!! SO SINGS ELVIS!!! LOL!